OK, all you diligent, analytical numbers-crunching Piggs are probably going to fall over out of your chairs at this one. No matter, we exist to give each other a laugh now and then. What follows is an artistic stab at extrapolating the current curves of housing price graphs. I simply sketched in the down side of the given curve, assuming it would be fairly symmetrical from up side to down side. I projected this till its height was roughly even with the height of the previous low (1996). I thought it interesting that in both cases my "Sharpie-projected bottom" comes out about 2013. Although with the second, more recent curve, if the rate of descent stays nearly as steep as it is now, and doesn't "ramp out", the bottom could come as soon as 2011 (indicated by the faint, straight grey line). Let the comments, laughter, etc ensue. Submitted by jpinpb on March 19, 2009 - 1:47am. If it really fell that low, I would kiss you! Submitted by svelte on March 19, 2009 - 2:04am. If you look closely at the curves for the 1980 amd 1990 "bubbles", you'll notice that the upward side of the line is steeper and the downward side is more gradual. This 2006 bubble has been steep on the downhill side, but I'm wondering if, now that it is down to a "normal" bubble size, if the downward side might become more gradual, too. If my theory is correct, that would put the bottom even further out than 2013. Just a thought. Submitted by SanDiegoDave on March 19, 2009 - 2:04am. Inflation will hit long before a year 2013 bottom is reached. In terms of adjusting for inflation, it "may" be accurate. But in real dollars, we'll hit bottom by mid-2010. Submitted by peterb on March 19, 2009 - 2:29am. I have no problem seeing 1997 prices in the next couple of years....and the reason will be that no one has money to buy a house. Careful what you wish for. I've said it before on this site many times....when prices get to where everyone wants them, it will be because the economy is on life support. Will you have a job and the desire to take on a big debt in this situation?? I think fear will rule the day, not greed. Submitted by sdduuuude on March 19, 2009 - 2:52am. Submitted by hugo on March 19, 2009 - 3:20am. Thanks Cricket. Here's a NYTimes graphic that I linked on another thread (go the the second graphic). 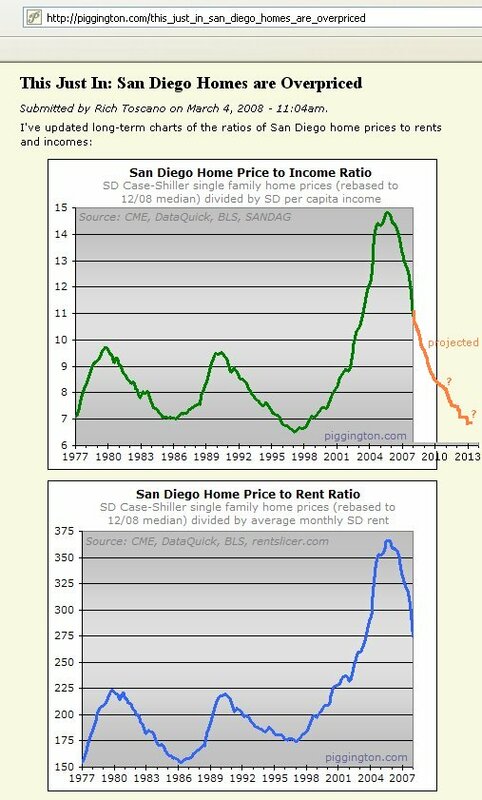 Like your graphs, it shows we are not yet back down to the tops of the previous housing upticks in the 70's and 80's. Submitted by sdchris on March 19, 2009 - 3:46am. I agree with this. At some point we're not going to see a decline in home prices. They'll probably remain stagnant for years allowing inflation to catch up. Submitted by carlsbadworker on March 19, 2009 - 4:55am. OK. I agree that's one possible scenario. But Warren Buffett said, "Predicting rain doesn’t count, building arks does." So what do you suggest us to do now to prepare for that? Starting to hoard cash so that one can pick up a property with 100% cash at low-priced area at that time? But if things are that bad, shouldn't people really start to worry about the low-priced neighborhood turning into ghetto? How can we likely profit from the above scenario or you think we are doomed regardlessly? Submitted by carlsbadworker on March 19, 2009 - 5:05am. By the way, just want to emphasize that this is a much worse scenario than what is predicted by OP. Others are still predicting 1997 inflation-adjusted price but I think you are predicting 1997 nominal price. The economy is deteriorating fast from the beginning of this year, so I don't want to rule out your scenario. I am just wondering what is the optimal plan to manage such risk? Submitted by peterb on March 19, 2009 - 5:19am. From what I can tell, the only asset that has growth potential is gold and gold producing miners. Because it's real money in a world of monetary confusion and deflation.Gold mining is now the most profitable business in the world. And gold now has the highest relative strength of any asset. People think gold is an inflation hedge, but the historical record shows it to behave very well during financial chaos. I think we'll see financial chaos for at least a couple more years. Wage deflation will come with unemployment. Credit is being repudiated. What will things cost on a cash basis compared to the rampant credit expansion we've seen over the last decade or so? I think that certain life sustaining commodities will probably increase in cost as fiat currency is debased. But things that took massive credit to maintain their prices will come down. Without wage growth, how can credit based purchases increase or even hold their price? Loans would have to be almost interest free. But who wants to take on debt to purchase something that's going down in price? Submitted by carlsbadworker on March 19, 2009 - 5:45am. peterb, I find your viewpoint interesting. So far, the FED and the government are worrying that the lenders will not lend the money because the risk is too high. But you are instead implying that the general American public borrowers don't want to borrow as well. Goldman Sachs is already predicting that the saving rate will go up to 10% this year. So in your scenario, the US will actually become a nation of savers in spite of government reported CPI (which doesn't count housing costs, but does count rental cost) has started increasing? So I guess, it will be in fact perfectly safe to take risks at that time when the others are in fear? Because the economy will have strong footing from then on because the saving glut will provide adequate support for the economy going forward? Submitted by Chris Scoreboar... on March 19, 2009 - 5:54am. My extensive research into the relationship between gold prices and financial crises shows no relationship but a very strong one between gold prices and inflation. I devoted a whole issue of my newsletter two years ago to this topic. For those of you that read in here and do not do your own research, please be careful with these types of comments, they are inaccurate. It may happen by coincidence that they relate going forward, but there is no consistent historical basis for this assertion. The gold and metals trade is very crowded right now, nary a person out there except me and a few much more accomplished traders than I am have been looking at the short side of gold. Markets top when everyone has already bought, and in my view, everyone has already bought metals. Even Joyce Brothers is on the radio hawking gold! Gold was free falling until the PPT showed up yesterday to reverse it and a few other things. Submitted by Arraya on March 19, 2009 - 6:05am. Bretton Woods II is on its last legs and cannot possibly survive. The only thing we do not know is the timeframe. The global monetary system could collapse next month, next year, or central bankers might manage to keep it together for another five years. Meanwhile the Grand Experiment Continues. And as central bankers worldwide continue their coordinated competitive currency debasement silliness, one beneficiary is likely to be gold. I don't think there is any historical precedence for a currency ceasing to be the reserve currency. Submitted by peterb on March 19, 2009 - 6:38am. I think fear is the order of the day and will remain so for a while. Hence the desire for gold. Uncle Ben's monetization is not helping the US$. But credit destruction seems far greater than money creation. Give it a careful read. The logic is good. Relative strength is what matters. Sure gold can correct and probably will, but profitability will remain strong for miners. A high demand product with a very good profit margin. Sounds like a solid business concept in a highly confused world. Submitted by Eugene on March 19, 2009 - 7:11am. You're not doing this right. Let me help. Submitted by SanDiegoDave on March 19, 2009 - 7:35am. Don't forget about silver. Arguably even better than gold. Submitted by Nor-LA-SD-guy on March 19, 2009 - 7:36am. Ha, That looks like a Temecula Valley Graph only the date at the end of the chart should be Feb 2009. Submitted by ibjames on March 19, 2009 - 8:16am. lets say we start seeing that trend, how many here would just stay renters forever? Submitted by AN on March 19, 2009 - 8:31am. Good question. How many here would be willing to pay someone to rent a place vs living in it for free when you buy. Since it would it $0 when it decline 100%. Submitted by peterb on March 19, 2009 - 9:23am. Talk to people in fly-over states where homes have years of little appreciation....many choose to rent. Submitted by Nor-LA-SD-guy on March 19, 2009 - 9:37am. It's good these will be for free, I will take a few..
from what I understand SoCal had a fairly large inbound domestic migration according to the stat takers anyway. This happened during the first great depression as well, I think during the recession in 1980 also. Submitted by CricketOnTheHearth on March 19, 2009 - 9:47am. esmith wrote:You're not doing this right. Let me help. LOL to both of you. On gold, I agree that it's pretty much at a peak (a mesa, I'm thinking?). When it's hawked on TV that's a pretty good sign. I'm one of those Americans saving like mad, only I am trying to save more-- on the order of 15-20%/month, not counting 401K. Trying to get a decent down payment in time for the bottom. Submitted by zk on March 19, 2009 - 9:54am. Probably not many, but remember that many on here understand the cycles better than most and therefore might not fall prey to the fear that would be required for the predictions in that chart to come true. Even if all the piggs buy, there's still a lot of scared people out there. Submitted by scaredyclassic on March 19, 2009 - 9:56am. Submitted by SD Realtor on March 19, 2009 - 10:00am. The thing that I do not like about the graph is that it is to smooth for me. Whether we end up at 1997 prices or 2000 prices or 1992 prices, I think this cycle may be marked by a more schizophrenic decline where we have some cyclical rallies on the way down.